WASHINGTON — NASA has confirmed a new cost estimate for its James Webb Space Telescope (JWST) that a key congressional appropriator and critic cited in July in proposing to terminate the flagship-class astronomy mission. "NASA has completed a JWST replan that assumes a revised life-cycle-cost of about $8.7 billion and a launch readiness date of October 2018," agency spokesman Trent Perrotto said in an Aug. 26 email to Space News. "The $8.7 billion life-cycle-cost includes development, launch, and five years of operations and science costs." The review panel, led by John Casani of NASA's Jet Propulsion Laboratory in Pasadena, Calif., said the JWST program would need cash infusions of $250 million in both 2011 and 2012 to be ready to launch by 2015 — a year later than NASA's official launch date at the time. NASA did not receive the proposed cash infusion in 2011 and did not request it for 2012. NASA Administrator Charles Bolden told lawmakers in April that the agency simply did not have the extra $1.5 billion the Casani panel said was needed to get the program on track. The report triggered the NASA replanning exercise, but the agency up to now had been mum about how much the JWST program would ultimately cost. Citing JWST's chronic cost- growth problems, the House Appropriations Committee in July recommended canceling the program in its version of the 2012 NASA spending bill. Rep. Frank Wolf (R-Va.), who chairs the House Appropriations subcommittee that drafted the legislation, cited an $8 billion cost estimate for the program during the full committee markup of the bill. Wolf subsequently put that cost estimate as high as $8.7 billion. The Senate has yet to weigh in with its version of the 2012 NASA spending bill. NASA, meanwhile, is not saying how it plans to funnel the necessary extra funds to the Webb program, which previously was part of the agency's Astrophysics Division funding account. Following the release of the Casani report, NASA created a separate JWST program office that reports directly to Ed Weiler, associate administrator for NASA's $5 billion Science Mission Directorate. Perrotto said "final decisions regarding implementation of the JWST replan will be reflected in the [Fiscal Year] 2013 budget request." That means the effect of JWST overruns on other NASA science programs — and possibly on programs outside the Science Mission Directorate — will not be unveiled until February, when the White House, per tradition, submits its annual budget request to Congress. Two Washington-based astronomy groups now say preserving the JWST mission will require funding contributions from both inside and outside NASA's Science Mission Directorate. "What we have advocated is that the scale of the problem and the prominence of James Webb for the agency was such that it should be considered an agency-wide solution," William Smith, president of the Association of Universities for Research in Astronomy, told Space News Friday (Aug. 26). Webb's budget issues are "so large that they just can't be resolved purely within" the Science Mission Directorate, Smith said. 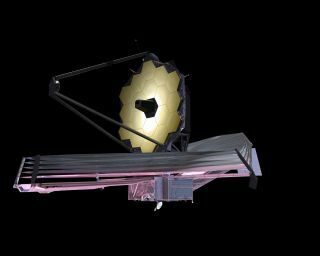 "NASA has a clear vision for JWST," said Bethany Johns, a public policy fellow at the American Astronomical Society. "It has done the replan. What they have planned is that there will be offsets to pay for JWST because it is now a priority of the entire agency." Both astronomy groups denied lobbying either Congress or NASA to cut specific programs in order to fund Webb. The Webb telescope, unlike Hubble, would be deployed far from the Earth at an Earth-sun Lagrange point — a point in space where the respective gravitational pulls of the two bodies cancel one another out. Hubble, on the other hand, is in a low Earth orbit and was deployed and later serviced by space shuttle astronauts. Whereas Hubble makes its observations in visible light spectrum — and to a lesser degree in the ultraviolet and infrared spectra — JWST is optimized for observations in infrared wavelengths.